This page will guide you through configuration and basic use of the CRM Connect Maximizer CRM Web Access Add-in.It is expected that you are already familiar with the Address Book, Call History and Preview window, and the basic concepts of integration and screen popping using the Add-ins.See the 'User Guide' for these topics. Maximizer CRM Web Access and the database used to store your contact data should already be installed and working normally before proceeding with this integration. IMPORTANT:Screen Pop is only available with Microsoft Internet Explorer. 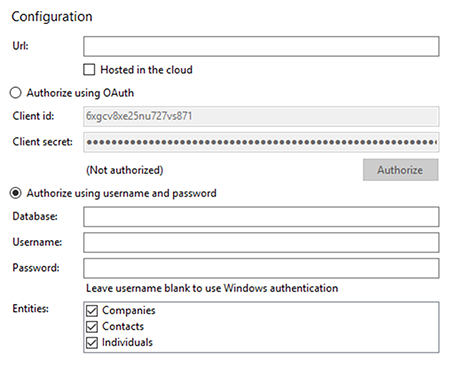 Web API / Web Access will need to be enabled by the Maximizer software maintainer. Right-click the CRM Connect tray icon in the system tray menu and then left-click the 'Configuration' option from the menu that pops up, this will open the 'configuration' screen.In the 'Integration' area, click the 'Add new' button, select 'Maximizer CRM Web Access' from the 'Type' dropdown box and then click the 'Set' button. On the 'Configuration' group, enter the URL used to log into your Maximizer application. Enter the database name for the Maximizer CRM Web Access account which is selected when you log into Maximizer as highlighted on the example. Now enter your Maximizer account login information into the 'Username' and 'Password' textboxes. 'Companies', 'Contacts' and 'Individuals' are the categories of record in Maximizer that can be looked up in searches and popped; select any or all of them by checking the corresponding boxes to include them. To test if the configuration worked, enter a phone number from your Maximizer account into the 'Telephone' box in the 'Integration test' area and click the 'Search' button.The results will be displayed after a few seconds. To make a call using Maximizer VOIP protocol, you can click on a contact to highlight them and then select 'Make a Call' from the 'Action' menu. Alternatively, you can either right-click on a contact, select the 'Phone' option and then click the 'Make a Call' option on the pop up menu. Or on the 'Contact Details' click on the 'Phone Numbers' icon. Either way, the 'Phone' window will be opened. 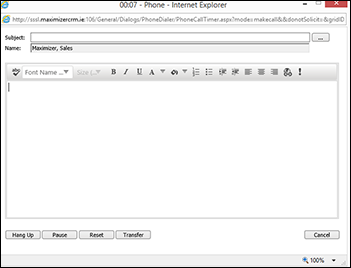 Here you can select the phone number and dial protocol to make the call, the list will display the VOIP / IM protocol and phone numbers stored againt the contact record.When ready, click the 'Dial' button to make the call.The buttons 'Answered', 'Message', 'No Answer' and 'Busy' do not control the actual call. 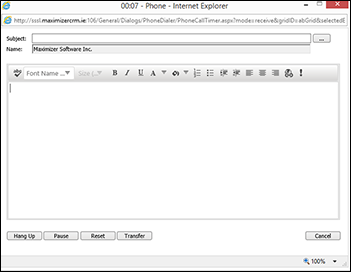 For example, if the call is answered and you click the appropriate button, a new window is opened where you can record notes on the call.Note:Apart from dialing out from Maximizer, other call control functionality is not available within this window, for these please use the CTI client call control options.. When a call comes in and the caller is a contact stored within Maximizer, click the Maximizer icon on the preview window to pop the caller’s contact record. 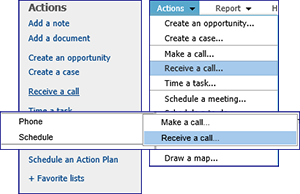 Then, in Maximizer, you can either select 'Receive a call' from the 'Action' Menu. Alternatively, right-click on the contact, select the 'Phone' option and then click the 'Receive a Call' option on the pop up menu. Or on the 'Contact' record select 'Receive a call' from the 'Actions' options. Again, in much the same way as dialing, you can select a subject for the phone record.However, this time, click the 'Incoming' button. Note:Apart from dialing out from Maximizer, other call control functionality is not available within this window, for these please use the CTI client call control options.